Aren't these adorable? Little itty bitty envelopes, only 1.5 inches wide! I don't know what I'm going to do with them, but they're fun to make. Max likes to fold them into shape, write "notes" (really just his name) on tiny pieces of paper, stuff the envelopes and seal them with stickers. They're quite a hit in our house! 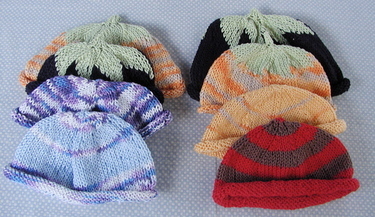 The final crop of baby hats, off to the various breastfeeding events. Eight in all, four to each. I had fun experimenting with the colors and styles. ...and a few for the shop. I love the brown/blue combo of those last two. The yarn color name is taupe, but it's more like a milk chocolate brown, perhaps a wee bit lighter than that. Not what I think of as taupe. 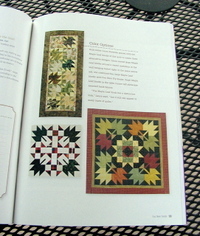 At Quilt Camp last week, I won a door prize, a book of quilt patterns. Better Homes and Gardens, Our Best Quilts. 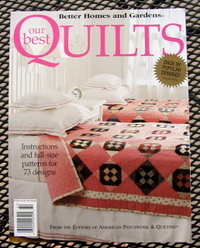 It has instructions and patterns for 23 quilts. While these are nice patterns, I probably won't use it much. So I'm offering it up as a giveaway. Here are some pictures from the book. One of the things I like is the "color option" sections, where they show the pattern in different colorways. Since I have a difficult time imagining color combinations, I find this a nice touch, to help me visualize what a pattern looks like in pastels vs. jewel tones vs. browns, for example. Last night at 11:30pm I finally finished moving my office. I'd been at it since 7am. I knew this was going to be an unpleasant weekend, and have been dreading it for days. At least it's over now--the moving, not the weekend. 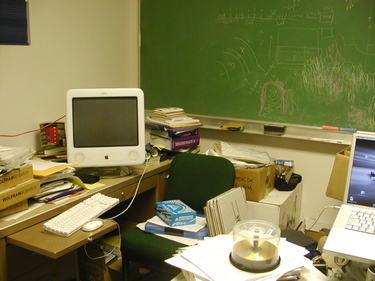 I'd been in my previous office for probably 5 or 6 years. If you know me (or if you've gotten to know me via my blog), then you know that I'm not one of those organized, neat people. No-siree-bob. I'm more of the "oh my god, did a bomb just go off in here?!?" type of people. Even more so after Max's arrival. There was so little time at work, and so much to do, that it felt frivolous to "waste" it cleaning. So I just started new piles all over my office. 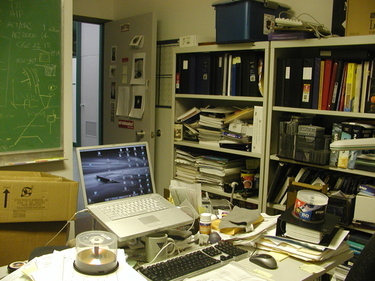 This method led to some lost papers and a horrible, unpresentable mess. Anyway, since I've quit one aspect of my job and am reducing my hours, I couldn't keep my solo office anymore. I had to move down the hall, sharing an office with a very sweet woman who is not here much. It's a nice office, with a much better window. But the down side is that my space is MUCH smaller, probably about 1/4 the size. 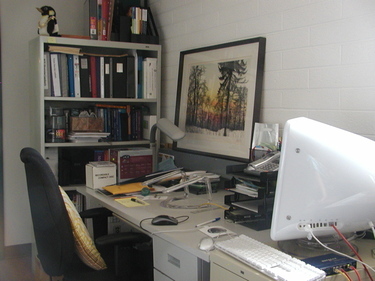 And since I'm sharing the office, I want my space to be presentable, not stuffed to the gills and overflowing with paper. So I've spent the last 3 Saturdays at work, cleaning out my old office and moving into my new office. Tossing, consolidating, storing, keeping. Oh, what a chore. 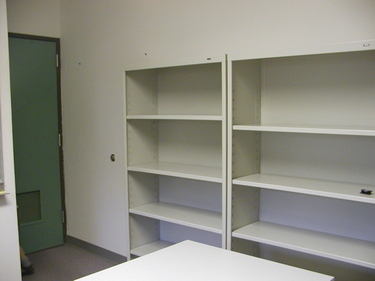 I had to reduce my stuff from 3 bookcases to 1, from 3 filing cabinets to 1.5, and from 2 desks to 1. I'm finally finished, and it feels good. It's still a little more stuffed than I would like, but at least everything is in the new office and it's only a *little* more messy than I was going for. I'll work on further tidying a little more slowly. Although painful, it was good to do this. Certainly nothing short of a move down the hall was going to get me to clean my office, even though it sorely needed it. Thanks to everyone who posted blog entries this weekend--they really kept me going! I would clear off a shelf, read a blog. It was so much more pleasant than just motoring through the cleaning. It's an emotional job, having to decide what part of my professional life to keep and what to toss. I'm glad I had little breaks to distract me every once in a while. If you are in good health, don't have a heart condition, and are sitting down, take a look at my before and after pictures. Just warning you, the before pictures are not pretty. Ugh. What a mess. I didn't like being here. (I can't imagine why.) But cleaning was such an overwhelming job. I hesitate to show these, y'all might think I'm a total mess. I certainly wouldn't show them by themselves, but since I have "after" shots, you have to see these too. Not very interesting, an empty office, but I wanted to assure you that there ARE surfaces under all the paper in the previous pics. I still have some work to do, to organize and pare down more, but I'm pretty happy with what I've done so far. Now I just have to try to keep it clean! A few weeks ago, I wanted to sew something EASY. Probably because I've been working on a few new patterns for things that weren't working as well as I had envisioned and I was frustrated. So one afternoon, Max and I played bean bag toss with a set that my mom made and sent to him a few years ago. She even made a little matching carrying bag for them. I like to "borrow" the bag for my latest knitting project or whatever, but since they match this bag always makes it back to its original purpose. 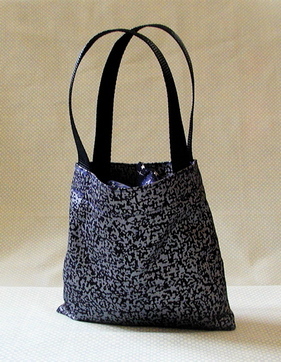 And here's the carrying bag, a lovely Marimekko remnant. It's perfect for this as it's a thick, heavy duty cotton. 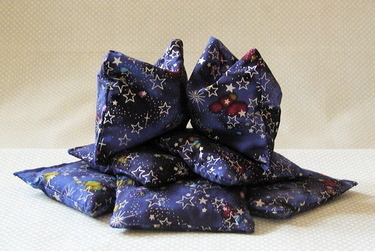 And the pattern fits into the space theme of the package, as it reminds me of the cosmic microwave background radiation. These were just what I needed. Simple, easy, fast. Sometimes it's really nice to do something like that. 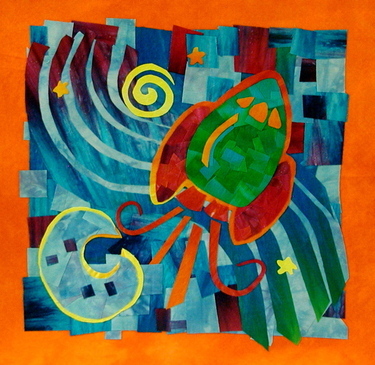 I had a wonderful time at Quilt Camp this week, two full days of nothing but quilting. Here are my creations, in various stages of progress (perfect for WIP Friday, eh?). First is the chicken. 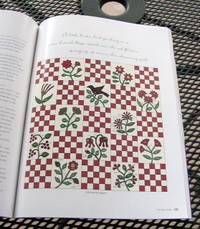 This is the "Frieda Fryer" pattern from Laura Wasilowski's Poultry in Motion series. I made this in Laura's woodcut class. You can see the black outlining around the chicken? That's like woodcut lines. I quite like this method, maybe because I love woodcuts. 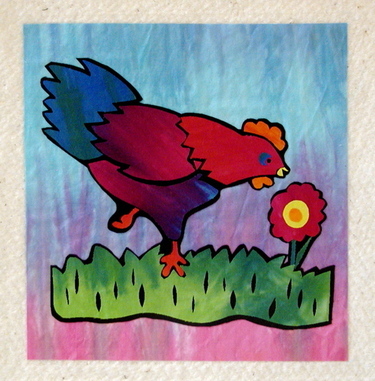 I'm still working on what to put on as a border around the chicken, then I need to quilt it and bind it. I tried a pastel stripey border yesterday, but it was just wrong. So now I have some dark blue and an idea involving multiple suns--an otherworldly chicken? Chickapoo was from my class on Wednesday, my first class. There are lots of very experienced quilters in this camp, and since I've been quilting for only about a year, and have finished only one quilt, I was feeling a little tentative. But Laura explained the process very clearly, and it's a no-sew technique so it goes very fast. Still, I didn't feel confident enough about making my own design to do in this class. 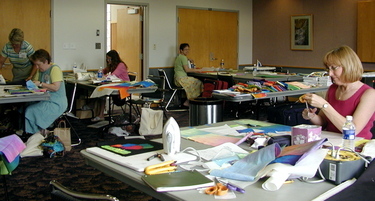 A lot of the other campers were not so afflicted, and after approximately 5 seconds of thought, they headed off, clipping away, creating quilt masterpieces straight out of their heads. I'm still impressed. I sketched it out the night before--still not quick enough to do it right there in class. But I'm so happy that I actually made something myself, not copied or from a pattern. In class we auditioned several background colors, and bright orange seemed to be the most vibrant. I'm not an orange person, but I do think it works here. Surprisingly (to me), fuchsia also worked, but was more subdued. I'm going to finish this one like a traditional quilt, with a sewn border and all that. Some more pictures from my first day. 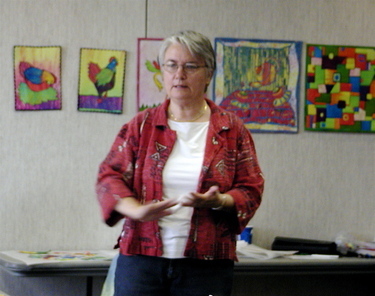 Our teacher, Laura Wasilowski. She's quite the entertainer: singing, dancing, and teaching too! 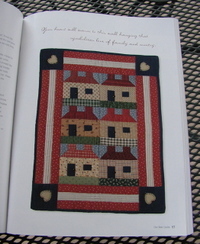 She has a business, Artfabrik selling patterns, quilts, and hand-dyed fabrics and threads. 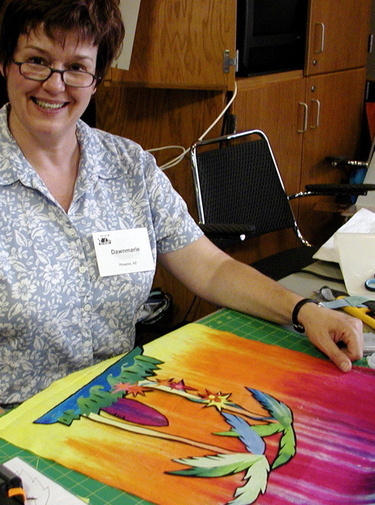 She brought lots of her hand-dyed fabrics, and those were what we used for the quilts. They're absolutely beautiful! I may have to sneak into her class on Saturday to buy some more. Here are the woodcut quilt samples for my first class. Laura made all of these, and explained the techniques for each so we could choose one type to make. She had patterns for the chicken ones, which is why I chose that. My sweet table-mate, Dawn, and her amazing creation. A beach scene. All freehand, straight from her head, no pattern. Isn't it beautiful? And one last picture. 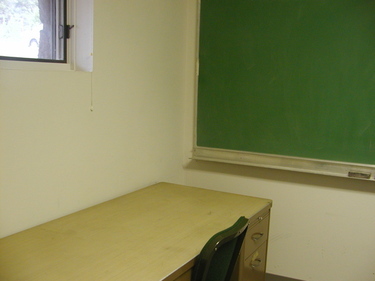 If you're wandering around in an unfamiliar building, looking for your classroom, how do you know you're in the right place? 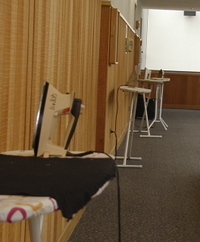 If you're at quilt camp, this is how you know--ironing boards lining the whole hallway! Finally I'm joining the Friday WIP theme (but haven't managed to flickr any of my photos yet). 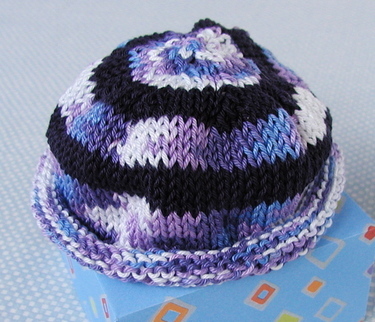 Here are some baby hats that I'm working on for Stephanie's call for hats to support breastfeeding. I know, you're thinking "how do hats support breastfeeding?" Well, there's a connection, read about it here and here. Basically they'll be given out to promote interest. Since I haven't posted in a while, I didn't get to mention that I met the lovely Becca, the only local blogger I know about, at a local bagel shop this past weekend. Stephen, Max, and I were having breakfast there, and luckily she recognized me (or Max), because I didn't recognize her. I was fairly well out of it, having just returned from our road trip the day before (and generally being fairly well out of it, even if I haven't just been on a road trip). One more WIP photo, I'll post more later when they're finished.